In my last blog about dirt I encouraged all of you to not let a little dirt keep you from planting something. Today I’d like to explain one of the best ways to make your dirt better! Mulch… Mulch… Mulch… This is a concept not talked about enough. Mulch has three main jobs to do, water retention, weed suppression and soil enhancing. If the sun cannot beat down directly on your soil then your much savored water will not become relative humidity so quickly. An added benefit of sun being kept from your soil is weed seeds cannot germinate. Less well known is at the end and beginning of every good growing year is the turning over of your soil which mixes the mulch into the soil and thereby enhancing it! Using mulch as an additional way to create micro-climates is just killing multiple birds with one mulch! Color of your mulch can be very important. Choose color by the area in which you live, area the plant will live and the overall need of the specific plant. For example, you would not want dark mulch around a lettuce patch planted on the south side of your garden with full desert sun. In contrast you would want it a the base of all your tomatoes on the south side, in full sun! 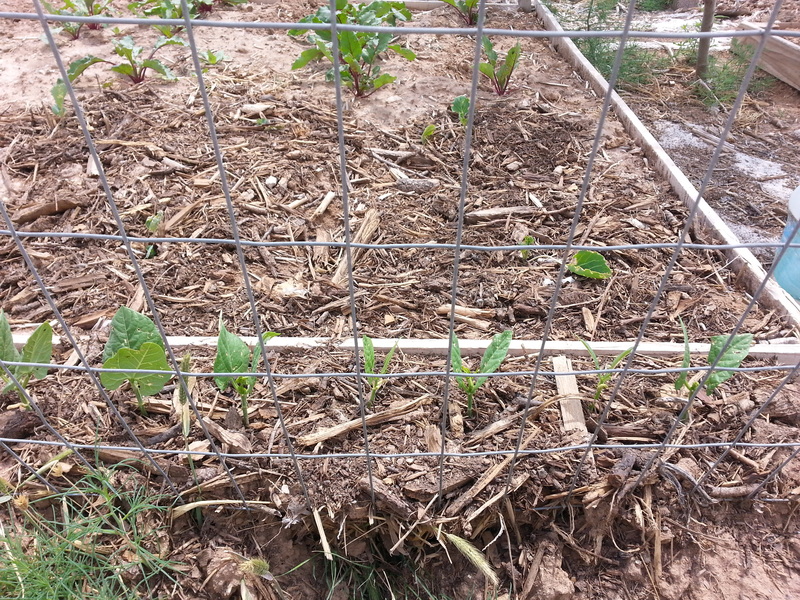 Lay mulch thick enough to disable weed seed germination. Go all out here! Less germination means less time on your hands and knees pulling pesky weeds! Enough said right?!?! Every year at the end of the season, or at the end of a particular succession planting, turn the soil over. This goes for all your perennial beds too. It takes a little more care with perennial beds so as not to disturb to much of your roots, but well worth it. I moved 4” deep mulch in a friends garden bed to find the dirt underneath impenetrable. This of course is going to make most water run off and limit the expansion of roots, which in turn limits the health of a plant. Though it seems like a waste to have to re-mulch every year, the more you turn your beds the deeper your nutrients and composting mulch can be effectual. A bonus is changing up the scenery! Mulch should change every year keeping a minimum of a 3 to 4 year rotation. Thankfully there are varying mulches in every color! Each with its own benefit to the soil when composted. My mind boggles when I try to research all the ins and outs of different decomposing mulches. Here’s the idea, as with a varied human diet you introduce a wider arrangement of nutrients, vitamins, and minerals to your body… so as with a varied mulch diet for your dirt! Even some food scraps make great mulch like coffee grinds and crushed eggshells. If there is a particular problem you are facing, look it up, otherwise don’t get to overwhelmed by the influx of information on the subject. Listen, the bible is pretty clear about the hard work it takes to eat. It says in Genesis 3:19 In the sweat of thy face shalt thou eat bread, till thou return unto the ground. Another is 2Thessalonians 3:10 For even when we were with you, we commanded you, that if any would not work, neither shall he eat. Jesus did a wonderful and powerful thing when He freed us from sin. However sin is still an option and inherent in this world. Until He burns this world up and makes a new one, we are going to battle with inherent sin. For example, I’m certain this fallen world is responsible for noxious weeds and pesky bugs! We can win though! When we approach gardening with appropriate respect for the Creator and deep understanding that life ONLY comes thru Jesus, we can see a temporary lifting of the curse and a beautiful blessing of bounty. Then the work is no longer a curse but a blessing. A type of rest, in Jesus. I encourage you that as you work these mulch and compost concepts out in your dirt that you remember the parable of the seed told in Matthew 13. We are the dirt. Remember we are dust. How are we letting Jesus water us? Mulch us? Turn us over? How are we willing to hear, understand, process input and therefore produce fruit? As the sweat does drip down your face remember that Jesus puts much more work into us if we will let Him. Do not be fooled into thinking that you are automatically “good dirt”. Almost all dirt will grow something…. what are you growing?